Roxy-Pacific Holdings - Ready, Set, Go! Roxy-Pacific Holdings' FY17 net profit -41% y-o-y; lower development profits and income from investment properties (divestment). Unrecognised sales stood at S$459m; largely in Australia with expected completion in FY18/FY19. First launch in FY18 saw 50% take-up. Declared final div of 0.771 Scents; maintain 40% payout. Maintain BUY; Target Price of S$0.69. 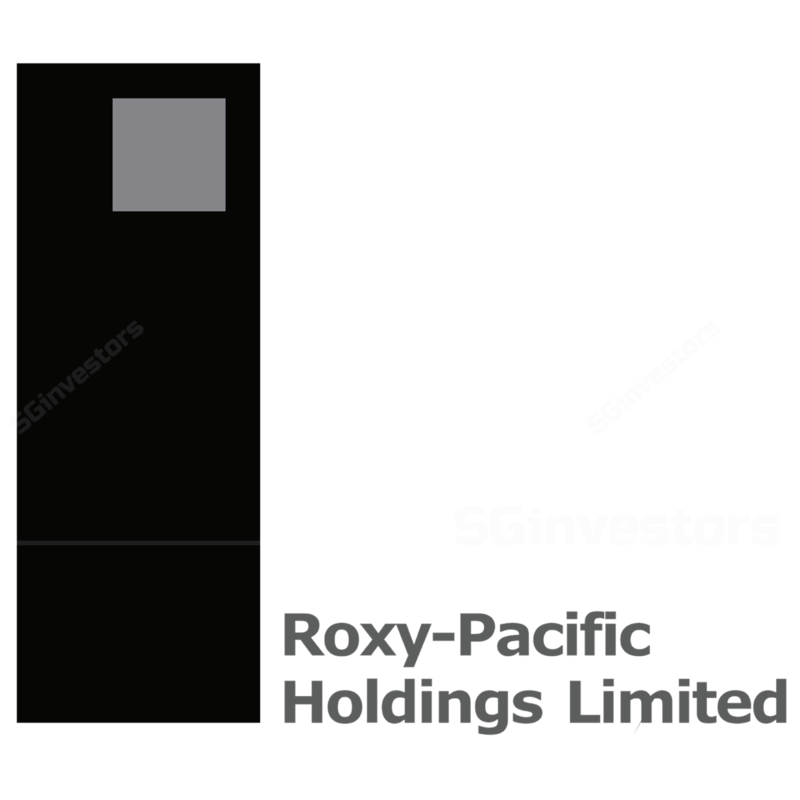 We are maintaining our BUY rating and Target Price of S$0.69 (based on 30% discount to RNAV) on Roxy-Pacific Holdings (Roxy). Benefitting from being early in the current en-bloc cycle, Roxy is one of the few “undiscovered” mid-cap developer proxies to ride the recovery of the Singapore property market. Poised to hit an upbeat Singapore property market with six freehold residential developments. We are one of the first few brokerages to have initiated coverage on Roxy. While the market may have overlooked Roxy for its size, we believe “best things come in small packages”. We believe Roxy, being one of the earliest to landbank in the current market cycle, has six freehold residential developments in Singapore which will be ready to launch in 2018, two to three of which will be launched within 1Q18. We see this as a window for the group to capture the rise in buyer demand before its peers. Strong sales take-up, more landbanking, acquisitions of good-quality investment properties. Lower FY17 results but all eyes on FY18. FY17 net profit fell 41% y-o-y largely from lower contributions from development properties and investment properties (post-divestment). Despite a weak FY17 results, management is upbeat on FY18, anticipating better property sales, contributions from newly-acquired investment properties, and a better outlook on Singapore’s hospitality sector. Declared 0.771 Scents final dividend. 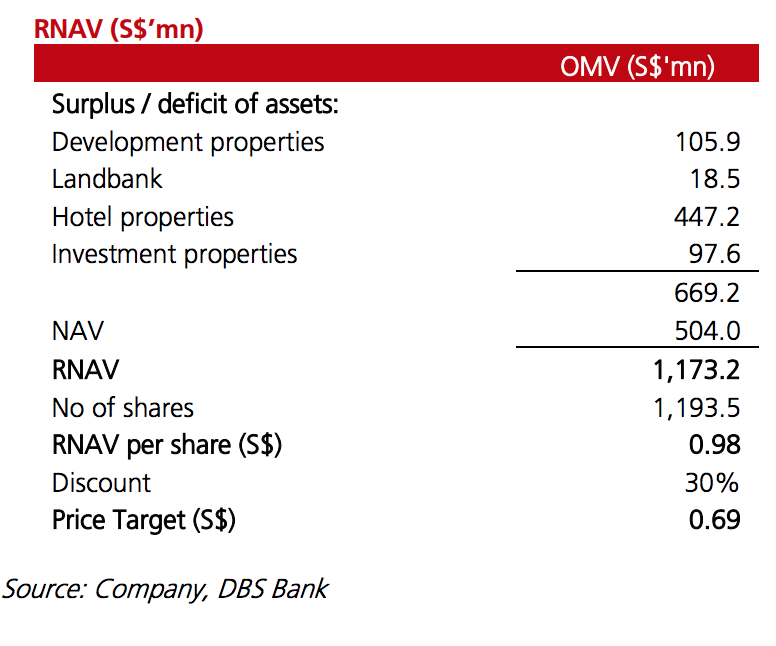 Our Target Price of S$0.69 is based on 30% discount to RNAV of S$0.98. The stock currently trades at 1.2x FY18F P/BV, below historical average. At its peak, Roxy trades at 2.3x P/BV. acquisitions of less-desirable investment properties. WHAT’S NEW - Ready, set, go! Roxy’s FY17 net profit fell 41% y-o-y to S$29m, mainly due to lower revenue (-36% y-o-y) and lower share of results from associates (-30% y-o-y) on the back of lower recognition of Eon Shenton, partially offset by higher fair value gains from investment properties (+40% y-o-y). Lower revenue was recorded in all segments but mainly in development properties (-41% y-o-y) and investment properties (-14% y-o-y). The decrease in revenue from development properties was largely due to lower revenue recognised from projects completed or nearing completion in FY17 such as Jade Residences, Whitehaven, and LIV on Wilkie. In addition, there was an absence of revenue recognised from LIV on Sophie which was completed in FY16. The fall in investment properties was mainly due to the loss of rental income following the divestment of 59 Goulburn Street. Revenue from hotel properties fell 4% y-o-y mainly due to lower RevPar of Grand Mercure Roxy Hotel, following more subdued corporate activity in FY17 and pricing competition from new hotel supply. Gross profit margin improved to 24% from 21% in FY16, largely led by better margins of 15% recorded from its development properties (vs 14% in FY16). Roxy has declared a final dividend of 0.771 Scents. This brings total FY17 dividend to 0.985 Scents vs 1.667 Scents in FY16. The dividend payout ratio remains stable at 40%. As at FY17, unrecognised sales stood at S$459m largely from its Australia properties (89%) which are expected to be completed in 2018 / 2019. First launch in FY18 (The Navian) recorded 50% sales take-up in one month; targets to launch six properties (including The Navian) in FY18. Roxy officially launched its first property in FY18, The Navian in Jan18. As at 5 Feb 18, it has sold 23 units, 50% of total units, which is an encouraging sign, in our view. Conservatively, management targets to launch six properties (including The Navian) in FY18 with a total of 440 units. However, management hopes to launch another 1 or 2 more properties in FY18, if ready, to capture the demand as soon as possible. Next in line to be launched are Harbour View Gardens (after Chinese New Year) and Grange Road site (expected in Apr18) while the Upper Bukit Timah site, the River Valley site, and the Guillemard Lane site are expected to be launched in 2Q18 / 3Q18. Acquired three more land sites in Dec17 / Jan18. Roxy remains active in its landbanking activities and has accumulated another three more sites in Dec17 / Jan18 and now owns 10 development sites, as a mean to replenish its landbank and to capture good opportunities. The sites are located mainly in the RCR. Management expects to launch these properties in FY19. Received interest to acquire its 117 Clarence Street. According to media reports, we understand that Roxy has received encouraging interest to acquire its 117 Clarence Street office building in Sydney. The building was jointly acquired with Tong Eng Group in Feb16. Management may consider a divestment if the offer price is attractive. We have yet to include the new landbank in the numbers. Expect to see better RevPar in 2H18. While FY17 was a challenging year for its hotel property in Singapore, Grand Mercure Singapore Roxy, management expects to see some improvement in RevPar in 2H18 as supply starts to taper off, reducing pricing competition. In addition, management is upbeat on the major events to be held in FY18, following encouraging signs seen in the beginning of the year with the Singapore Airshow 2018. The newly acquired hotel in Osaka (Oct17) has been successfully rebranded to Noku Roxy in Jan18 which will be self-managed. Noku Maldives started operations in Dec17 and expected to be fully open soon while its hotel in Phuket is expected to be completed and begin operations in FY19. We maintain our BUY rating and target price of S$0.69. We believe Roxy is a good small- to mid-cap proxy to Singapore property and is poised to benefit from upbeat sentiment in the sector from the launch of six freehold residential properties before its peers. to change according to market sentiment. acquisition of good-quality investment properties. Roxy currently trades at 1.3x FY18F P/BV, below historical average. At its peak, Roxy traded at 2.3x P/BV.